Coverage of Take That's Progress Live 2011 UK Tour, in which the four-piece reunited on stage with Robbie Williams at the City of Manchester Stadium. One of the most-anticipated reunions in pop music history took place in the summer of 2011 when all five original members of Take That opened their spectacular Progress Live 2011 UK Tour at the City of Manchester Stadium. 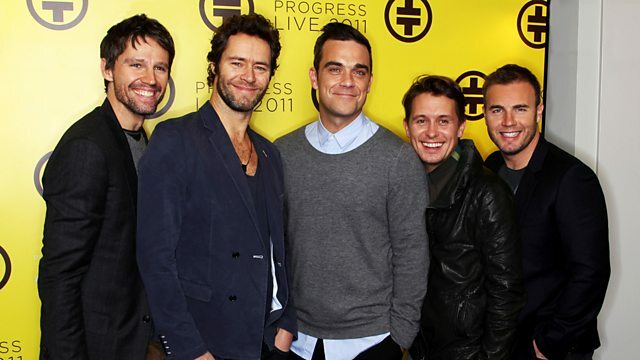 Playing to massive sell-out audiences around Europe, Gary Barlow, Howard Donald, Jason Orange, Mark Owen and Robbie Williams took over 2.1 million people with them on their 'Progress' journey, with a monumental two and half hour set filled with all the biggest hits from their incredible 20 year history. Progress Live 2011 is the first time the band had toured as a five-piece since 1995. The huge production wowed audiences with a non-stop, jaw-dropping spectacle, which included roller-skating bees, a giant purple caterpillar, Shaolin monks, a dancing chess set, a massive 30m wall of water scaled by acrobatic dancers, and a huge 20m robot named OM who moved ominously through the audience throughout the night. The show opened with Gary, Howard, Jason and Mark performing hits including Rule the World and Shine, before Robbie made his entrance for the start of a thumping solo set including Let Me Entertain You and Angels. All five members were then reunited for the song that marked their historic return, The Flood; and classic hits such as Never Forget, A Million Love Songs, and Pray.